Stoneware, relief, 0.5L. 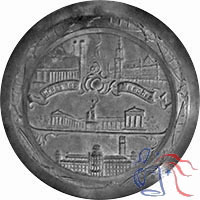 pewter lid. 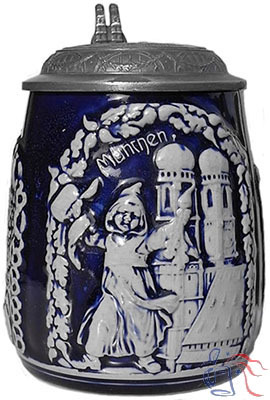 Created as the coat-of-arms or archival seal of Munich in 1239, the centrally depicted Münchner Kindl (Munich Child) has evolved from a hooded monk standing in front of Munich’s gate to a charming child and symbol of the city. Shown in the background are the iconic onion-domed towers of Munich’s Frauenkirche (Church of our Lady). 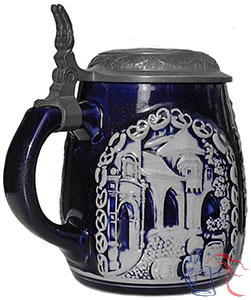 The Hofbräuhaus and the Bavaria statue, two famous Munich landmarks, are pictured on the sides of the stein.